FIVE years after meeting in an oxygen therapy dive, bride and groom Karl Gase and Tracy Ratcliff are living with multiple sclerosis – together. The couple tied the knot at St Paul’s Church in Covingham on Saturday after their firm friendship turned into something more, and their illnesses led to the breakdown of their existing marriages. 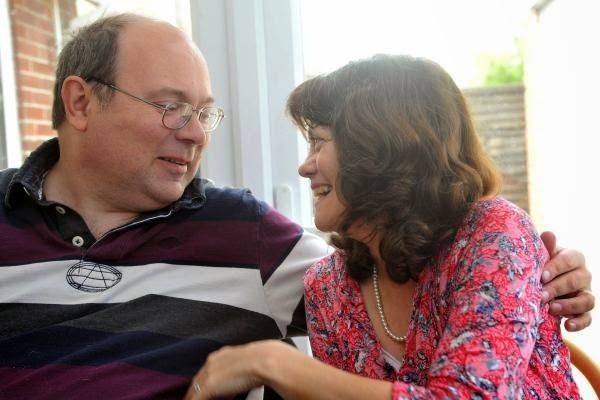 Proving that life goes on despite life-limiting illness, 51-year-old Karl and Tracy, 52, walked down the aisle watched by friends, family and congregation. They had known each other for years through the MS Therapy Centre, who were there to support them on their big day. “We just got chatting while in the chamber,” Karl said of their first meeting. “I was married at the time, but since then my wife decided her future lay elsewhere. “We sort of fell into it I suppose. It is about understanding that things do not work as well as they should sometimes, and helping each other through that. “For me MS is something that developed 15 years ago. At the time I was driving and walking and relatively normal. All of a sudden things just stopped working. It is almost like having a stroke, and I have lost the use of the right side of my body, and my speech has started to go. That can be quite traumatic, but I found the therapy centre which has been amazing. Karl proposed two years ago, choosing Tracy’s 50th birthday to pop the question. “As soon as we got in that dive together the friendship built from there,” said Tracy. “We’d both been going to the centre for about 10 or 12 years. Karl had to move out of his house, and when he did he bought a place very close to mine. We moved in together not long after that, and now I rent my place out. “The wedding day was brilliant, we have had so many cards, and there were about 90 people there altogether. I go to St Paul’s Church every week and there were so many people from the church there supporting us.